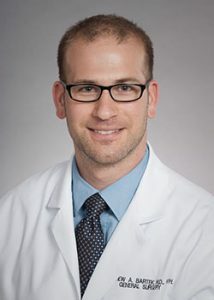 Dr. Bartek spent two years in the NIDDK-funded T32 fellowship in Gastrointestinal Surgical Outcomes Research at the Surgical Outcomes Research Center (SORCE). His mentors included Drs. David Flum, Professor in the Division of General Surgery, Dr. Sherene Shalhub, Assistant Professor of Surgery in the Division of Vascular Surgery, and Danielle Lavallee, Research Associate Professor in the Division of General Surgery. Under their guidance, Dr. Bartek conducted research on vascular surgery outcomes with a specific focus on surgical decision-making—both on the part of the patient and the physician—and how data can enhance the decision-making process. He plans to pursue an academic career in vascular surgery, and to continue to develop his research interests and skills to that end. Dr. Flaster completed two years of academic and clinical work in Israel. His research focus was on patient outcomes in cardiothoracic surgery, trauma surgery, and emergency medicine, with a specific focus on building databases and electronic medical records systems to track outcomes and ultimately elucidate ways to improve patient care. In addition, he developed his passion for using health care as a means to promote peace and dialogue between the Israeli and Palestinian people. Toward this end, he worked with Dr. Grant O’Keefe and others to find a way for Palestinian surgeons to do clinical rotations in trauma hospitals in Israel and the United States, as well as for Israeli surgeons to rotate through their Palestinian counterpart hospitals in the Palestinian territories, with the ultimate goal of creating an integrated trauma fellowship that would involve all three nations. 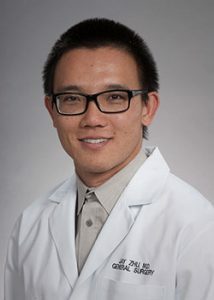 Dr. Seo worked as a research fellow under the collaborative guidance of Dr. Venu Pillarisetty, Associate Professor in the Division of General Surgery, and Dr. Seth Pollack, Assistant Professor in the Division of Oncology, and was funded by the Sarcoma Research Program at the Fred Hutchinson Cancer Research Center. In his role he helped complete and analyze the data for a phase I clinical trial in soft tissue sarcomas utilizing an intra-tumoral injection of a Toll-like receptor 4 (TLR4) agonist. In addition, he lead efforts to develop an in vitro tumor slice culture system, previously demonstrated in multiple solid tumors such as colon and pancreatic cancer, in leiomyosarcoma and liposarcoma. Dr. Seo and team worked to optimize the culture conditions for these slice cultures in sarcoma to allow for in vitro examination of the live tumor microenvironment, with the of demonstrating the maintenance of this architecture over time in culture and to then use multiple imaging modalities to test the local immune response to promising therapeutic agents (such as immune checkpoint inhibitors and TLR agonists). He additionally continued work previously done by Dr. Pillarisetty’s group in human pancreatic ductal adenocarcinoma (PDA) to analyze the specific immune response using T cell receptor (TCR) deep sequencing, in collaboration with Adaptive Biotechnologies. By using these high throughput computational methods and correlating the TCR data with whole genome expression from the same tumors, the team gained a better understanding of what activates or perturbs the immune response to PDA and to develop further hypotheses for therapeutic targets. 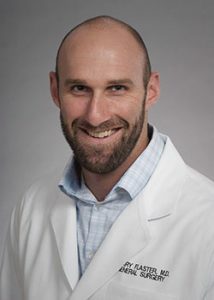 Dr. Verdial trained in the NIDDK-funded T32 fellowship in Gastrointestinal Surgical Outcomes Research under the direction of Dr. David Flum, Professor in the Division of General Surgery. Her research focused on addressing appropriateness of surgical care and resource utilization. Dr. Verdial’s research spanned multiple clinical areas, including lung cancer, breast cancer, small bowel obstruction, and bariatric surgery. In addition, Dr. Verdial received her Master of Public Health at University of Washington to help increase her knowledge of research methods and data analysis. 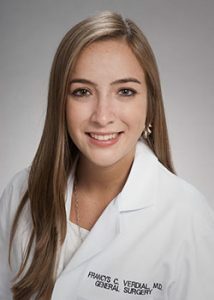 She eventually plans to pursue a fellowship and career in surgical oncology. Dr. Zhu worked as a research fellow in the NHLBI-funded T32 Cardiovascular Research Training Program under the mentorship of Dr. David Dichek, Professor of Medicine at the University of Washington. In this role, he investigated biochemical pathways involved in the development of aortic aneurysms in genetically heritable conditions such as Loeys-Dietz Syndrome. Specifically, his work focused on evaluating vasomotor function in an animal model with smooth muscle specific TGF-β deletion. 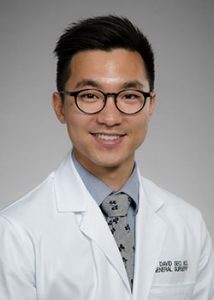 In addition to his basic science research, Dr. Zhu worked with co-resident, Dr. Kate Stadeli, to standardize clinical handoffs as part of a resident-led multidisciplinary quality improvement project.